This book is a truly riveting read from cover to cover. The author, a correspondent for The Times, has managed to convey the history and adventure of the era into a fast moving narrative of real life events. He charts the history of the British pitting their wits against the Russians, as they both expand in a cat and mouse fashion through the mountains and lands of Central Asia. It is one of the most interesting history books I have ever read. The history concerns the British paranoia over a Russian invasion of India. And doing absolutely anything on its North Western frontier to prevent any expansion of Russian influence. This paranoia pre-empts the Domino effect theories that so engulfed American strategic thinking in South East Asia leading ultimately to the Vietnam imbroglio. It just goes to show how history has a nasty effect of repeating itself, with very few people noticing. In vice versa, the Russian bear created as much suspicion and concern in the last century than it ever did in our present one. Peter Hopkirk's book also tells us that Russian self confidence and bravado was as much in evidence during the Nineteenth Century than in ours. One of the most interesting aspects of this book is how the author follows the fortunes of the individuals who played the great game. He makes the characters come to life as he narrates their fortunes in one of the most dangerous and inhospitable regions of the earth. He should also be commended for telling the story from the Russian side as much as he does from the British. This combination of informed impartiality combined with a journalistic flair makes for an excellent read. One story that is particularly well told is the disastrous retreat of British forces from Kabul in 1842. His description should be hindered by the fact that there was only one survivor from the main column. Yet, he manages to spin coherence and empathy into the byzantine world of Afghan politics that led to this humiliating tragedy. It is obvious that he has visited the places that he talks about, and this helps gives credence and plausability to the descriptive powers that he brings to bear on the subject. This in turn helps the reader to understand the political and personal forces that work to create such tragedies and events in history. The great game was a giant chess game where the opponents very rarely came into contact, but were always planning and machinating against one another. There were many casualties in this deadly game, most of whom belonged to the peoples sandwiched between these two Nineteenth Century superpowers. 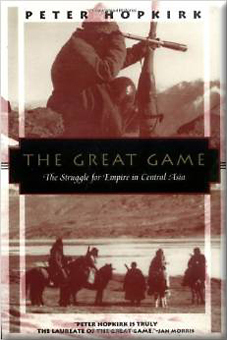 The great game was played for almost the entire Nineteenth Century and provided a constant source of irritation and antagonism between these two powers. Its ramifications were felt in the diplomatic playing fields of European diplomacy as well as through the rest of Asia. The clashes of culture and the extremes of geography provide a fantastically rich backdrop to the intense diplomacy, bluffing and fighting that went along with it. Peter Hopkirk describes all this and more in his excellent book.